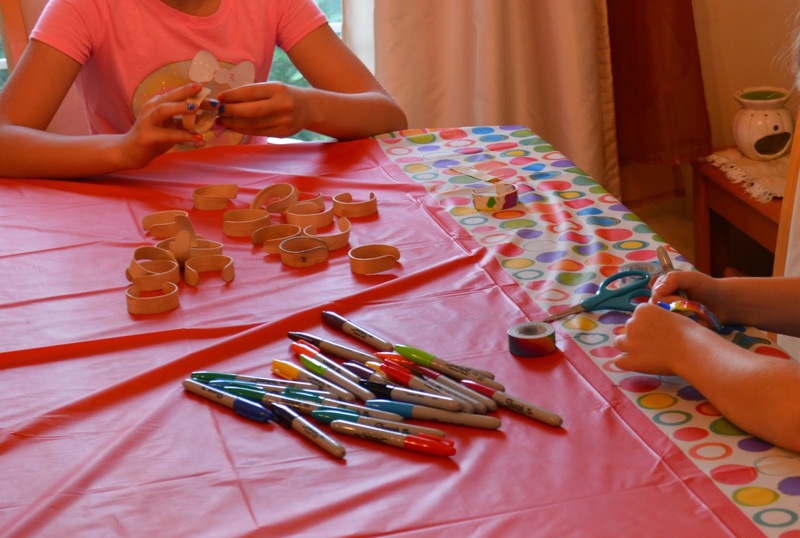 From Scratch: Party Time - A Brainy Party! Party Time - A Brainy Party! So, if you follow me on Facebook, you might have noticed that I pretty much went off radar for the weekend, because we had a big framily (close friends and family) party for my little two...who I guess are getting to be not so little anymore. Sigh. Yeah, I was not up to that creative challenge this time of year. So I started showing them ideas of cool projects we could do, things that I thought they might like, and we decided on this "Use your Brain" party. A little art, a little science, a lot of fun. And I mean a LOT of fun! We had so much fun, that I decided to share the activities with you here. While people were coming, I had things set up for these popsicle stick bracelets. When I was making them, I boiled the sticks for about 20 minutes and then took them out hot to mold them into wide mouth pint jars, and then let them sit for a day or two to dry and shape. I gave the kids permanent markers and some colorful tape to decorate the bracelets with. 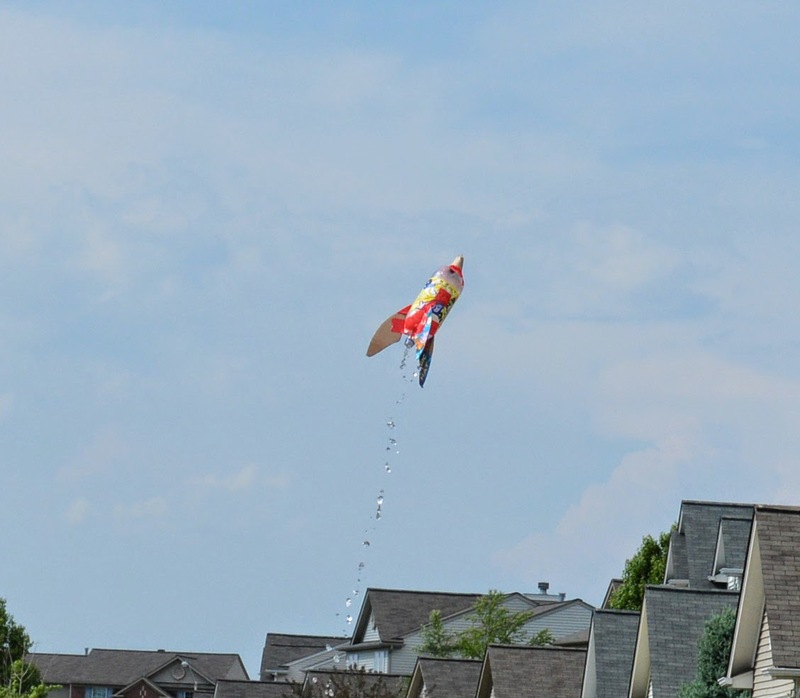 To kick off the party, we did this water bottle rocket from Science Sparks. My kids were enthralled with the video, so we decided to give it a try. 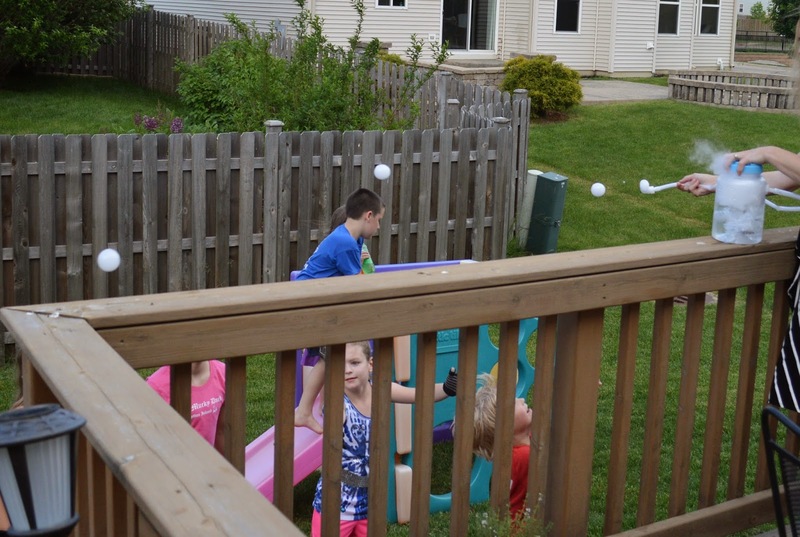 It went better in pre-party test runs, but it was okay for the party, and the kids got a kick out of it. It took a little more rigging for me than the site implied, because I couldn't find a foot pump like that with a needle, but I just got a regular foot pump and then added an inflation pin from a basketball pump. I also was surprised that a regular wine cork fits a 2-liter bottle, but that certainly made things easier. I cut the cork in half to make it work. Also, we used thick corrugated cardboard and duck tape for the fins, and they had to go way back on the bottle to be high enough to fit the pump spout under the rocket. For the next project, I had gotten these Brush Bot Party Packs from Maker Shed. The kits are easy to follow, and while the tiny wiring can be a little tricky when you're working with 17 kids, seeing the bots buzz to life made everyone excited. We also made little corrals for the bots by cutting paper bags into large rings. The kids ran them all over the place! Then the kids gathered around the tv to watch this No-Heat Lava Lamp episode of Sylvia's Super-Awesome Maker Show. My kids love Sylvia, and this project is amazingly simple and entertaining. 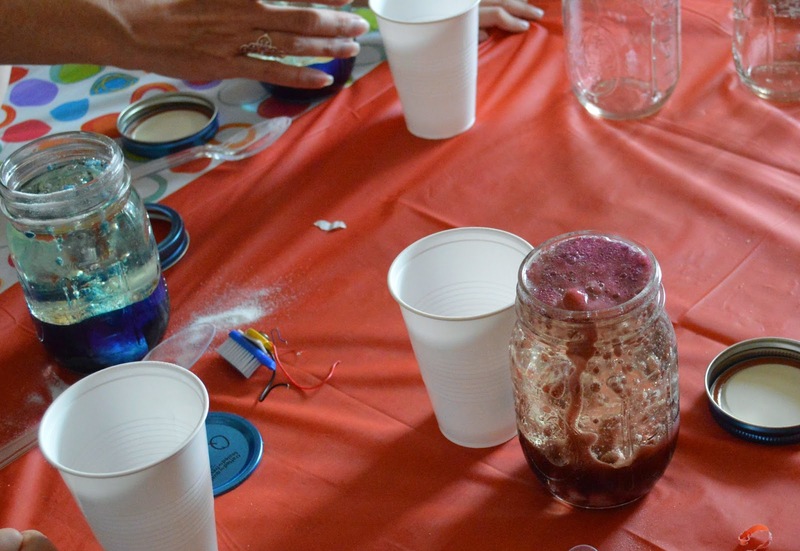 I had a bunch of mason jars ready for the kids, and each was able to make a no-heat lava lamp of their own. Next up, we took a cool-off break with this amazing instant slushee trick! Since I had lost track of time, they were probably in my freezer closer to 4 and a half hours, but with 17 in there, it worked out about right, and both the kids and the adults were shocked by the instant freeze action. 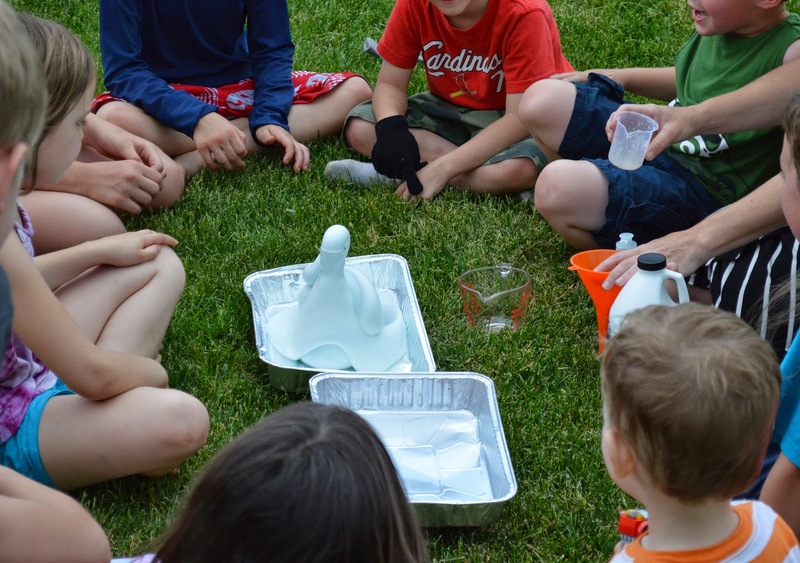 We went outside to make this Elephant Toothpaste from Steve Spangler Science. The only tough part about this one was finding the 6% hydrogen peroxide, but I was able to find some at a beauty store. The kids were amazed by the reaction, and loved playing with the warm bubbly foam. 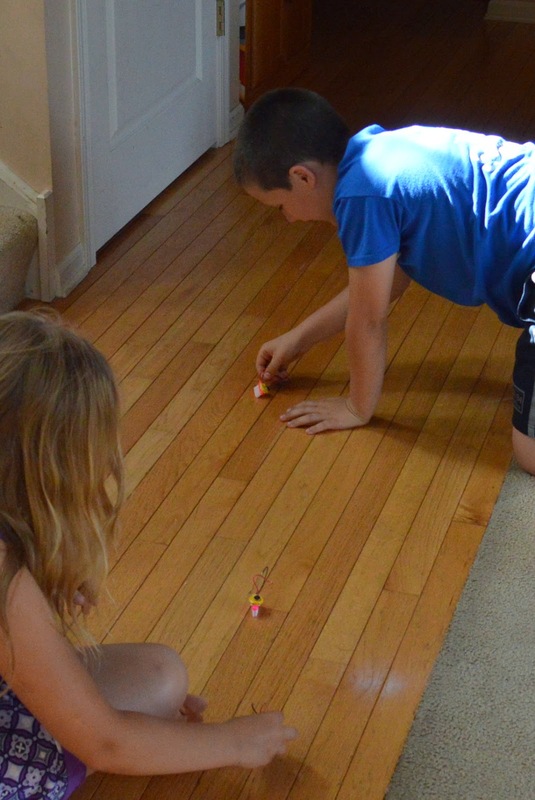 We also constructed these Kinetic Energy Marshmallow shooters. I think more marshmallows got eaten than were shot! The kids really loved Dry Ice Smokey Bubbles from this Steve Spangler kit, even though the wind was not helpful, and made it hard for them to catch the bubbles. I found the kit at Hobby Lobby, and was able to use one of their coupons, so it was more affordable, but you can also make your own, which was my original plan. I have to admit, playing with dry ice is pretty fun. As a party finisher, we constructed a garbage can smoke ring vortex launcher. I borrowed a fog machine from a friend, and we used plastic sheeting and a cheap garbage can to bring it all together. It was a blast! All together, it was a great time! The kids got to take home everything they made as favors, and everything went pretty well. The last of the party-goers left about 7 hours after the start of the party, so I'll take that as a sign that we throw a good shindig around these parts.